Best Fuzz Pedal - Learn about Germanium vs Silicon. What is the Best Fuzz Pedal? Germanium vs Silicon. Need a classic, vintage sounding fuzz pedal that lets your playing style through? 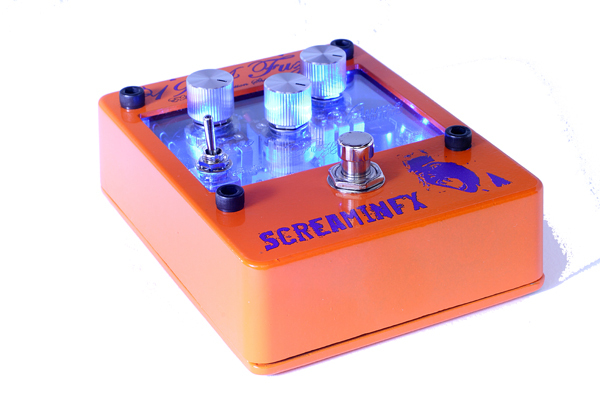 The ScreaminFX 1954 Transparent Fuzz is my newly designed pedal that takes it up a notch. 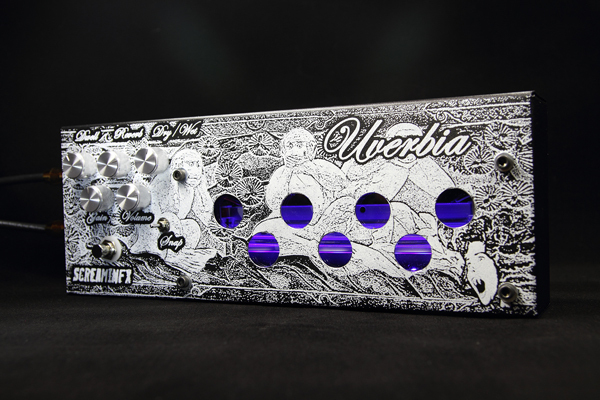 Check it out if you are in the market for a better fuzz. By Screamin' Seth W, Ph.D. The fuzz pedal is surrounded in mystique and legend, from specially selected pedals for Hendrix to expensive, no longer stocked transistors originally made in the 60s. So what is the best fuzz pedal? Should you pick germanium or silicon? What even is germanium? Should you use a power supply or battery? Should you buy a boutique pedal like the ones I make, or buy a massed produced one? After all, the original Fuzz Face was mass produced and heavily used. Ultimately, this is up to you and what sound you are after. Here, I explain why some of the differences exist and help point you towards the right one for your guitar pedal board. After all, they can be expensive so you should be armed with some knowledge. Pretty much every guitar legend has played through a fuzz at one time or another so its worth looking into. 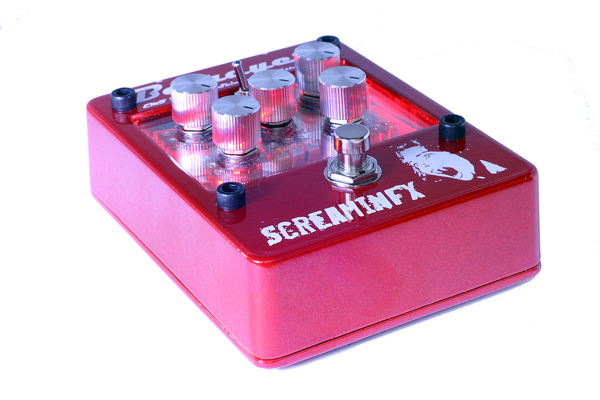 Quick Summary: Germanium fuzz is less harsh, more expensive and gives a vintage sound. Silicon fuzz is harsher with more gain. Silicon fuzz pedals are usually cheaper and easy to mass produce in todays market because most use modern low cost transistors. You should probably go with a battery unless the pedal has circuitry which modifies the input power. Boutique or mass produced – that ones up to you and what you like best. This is a new demo I recorded of different fuzz pedals I like and the ones I build. There is an intro, a short clip of each and then longer demos at the end. They are labeled as silicon or germanium fuzz and there is an oscillation test with a wah wah at the end of each demo. Pedals Missed: There are many excellent fuzz pedals on the market today. Some that I missed in the demo that you should check out are: Swollen Pickle, Big Ear Loaf and Earthquaker The Hof. Fuzz pedals, it all comes down to the transistors used to make the circuit. 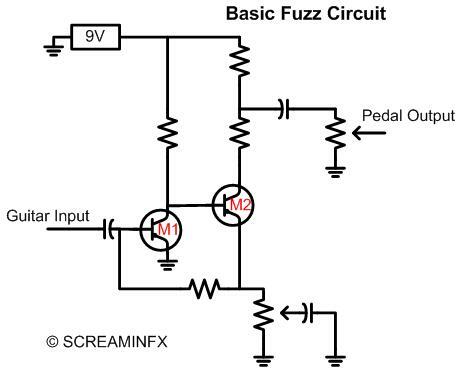 The fuzz circuit is actually very simple and is shown below. There are only two main transistors! All transistors are different, and with only two, their personality shows through which is what gives each one it's own personality. Even the same brand of transistors can have variations which is how a lot of the variability in germanium fuzz pedals comes about! How does the fuzz work? so if the input is low and output high, there is a lot of gain. Eventually someone came up with a circuit to maximize this gain, origianlly used for low gain tubes.. When a guitar is plugged in to a fuzz, the signal is amplified so much that it sounds fuzzy (distorted) because the signal gets so big, the transistors can't handle it. Lets look at this in detail. The general fuzz circuit consists of an input stage M1 and a cascaded transistor M2 (shown above). The circuit is basically an amplifier, which has a lot of gain so that the input signal is much higher (louder) than the output. The output of M2 is fed back to M1 which is called negative feedback and is in a shunt-series feedback configuration. Because the output is much higher due to the gain, it will cause the transistors used in the circuit to distort when the input guitar volume reaches a certain level. At first, M2 distorts but because the signal is fed back, M1 will cause distortion as well. When the fuzzy distortion is occurring, what is actually happening is that the voltage levels at the transistors are swinging enough so that it is entering a nonlinear region. In engineering terms, nonlinear just means that you dont get out exactly what you put in. Also known as distortion! So, when there is more gain or bigger input signals, you get more distortion. You are probably already wondering about the next question. Why does the fuzz clean up when you roll the guitar volume down? Think about that simple equation for gain, you can make it such that output = input*gain. Because the gain is constant, as the input gets lower the output level is reduced. Because the fuzz causes distortion when the transistors become nonlinear, higher input volumes cause more distortion. Now, because of the feedback of the fuzz, when they are designed properly they have high gain and they will be very sensitive to the input level. Side technical note and a major key to the fuzz, there are some other reasons why the fuzz is so sensitive. A fuzz pedal is usually made up of bipolar transistors (not MOSFETs) so in semiconductor terms, you have a PNP or NPN junction. This is essentially a current controlled device and the actual fuzz circuitis a current amplifier. What happens is, the more current you stuff into the input, the more output voltage you get. Because of the high output impedance of your guitar pickups, you can only supply so much current into the transistors relatively low impedance. This causes a notable change in the sound than if you were to use a much higher input impedance transistor such as a MOSFET in a voltage gain configuration. Whats the lesson here? The two transistors will distort due to an input signal and the circuits large gain. Because only wo transistors are in the main fuzz circuit, it is very sensitive to the transistors actual properties. Why do Fuzz Pedals sound different than many regular distortion pedals? This is another good question. As heavier music evolved, people starting trying to get more and more distortion. What people discovered was that instead of trying to cause a regular amplifier to become nonlinear, you could wrap diodes around a high gain voltage amplifier and cause much more distortion. The reason this worked is that in general, diodes will clip (distort) at a lower voltage than the transistor amplifier and it is much easier to create distortion with lower signals. At higher input signals, there will be even more distortion. It sounds different because the mechanism is diode clipping which is causing the distortion. So I still havent gone into what is the best fuzz pedal? Is it germanium or silicon based? Lets look at the two in detail. Starting from the beginning in 1948, the original commercial transistors were made from germanium material unlike all the silicon transistors we see today. Germanium is similar to silicon in that it falls on the same row of the periodic table and is a semiconducting material. A simple way to think of semiconducting material is that sometimes it conducts and sometimes it does not. This all depends on the actual voltage levels applied and the movement of electrons and holes in the material. Skipping the 4 year physics degree, this semiconducting nature can be used to make a transistor. Germanium transistors came out first, but they were notoriously fickle. The reason is that it takes a very precise method to form the PN junctions of the transistor which pushed technologies limits at the time. Slight differences in processes would cause a large variation in transistor gain. Additionally, an important part of many transistors is the formation of an oxide. With germanium, it is very difficult to form a stable oxide. So, you have a couple of things competing together, devices that are difficult to make and relatively unstable. Throw in the fact that they are very prone to temperature variations and it is easy to see why each specific transistor sounds different. Beta=current out / current in. Even though the fuzz circuit has feedback which helps offset Beta variations, this parameter is critical in determining the overall gain of the fuzz circuit. For a good fuzz pedal, it was found that the gain of each one of the transistors must be within a certain value for the fuzz to sound musically pleasing. Additionally, M1 needs to have a lower value than M2. So, if you read that a fuzz has hand picked transistors, or matched transistors, what it means is that someone has specifically tested and chosen those transistors to sound good in their fuzz pedal. This is what I do for the 1948 Fuzz I make. However, the original Fuzz Face was mass produced and each transistor was not specifically chosen. This is the reason why different Fuzz Face pedals sound a little different, and some better than others. On a mass market approach, it is extremely difficult to get the exact germanium transistors needed. Another reason is that germanium transistors have a lot of parasitic capacitance. This sounds a little difficult, but all parasitic capacitance basically means is that the transistor can store charge in areas that it is not meant to. What this leads to is a change in the way it sounds, because storing charge basically slows the voltage time response of a circuit. When this happens on a slow enough scale, it will make the sound of the specific transistor sound different musically. After all, sound through your guitar pedal can be simply looked at as a changing voltage level in time. Its the speakers that convert it to a wave that your ears can hear. The main change is that higher notes and harmonics will be cut off more. Did you ever notice that some germanium fuzz pedals sound bassier? So, germanium transistors have two main attributes. One is that they have very wide variability and its very difficult to get two that are exactly the same. Two is that they have a lot of stray parasitics which affect voltages that are in the musically audible range. Obviously, these two traits affect the fuzz pedal. As companies pushed forward, it was realized that silicon devices were easier to manufacture reliably and had much less variability. One of the biggest discoveries was how to make silicon oxides directly on the wafer. This revolutionized transistors and allowed the MOSFET to be developed. However, what we really care about are good old PN junction silicon transistors (bipolar devices). Another major change was the method used for doping the transistors. Doping is the addition of impurity atoms used to change the material to either more positive or negative. Methods of implanting ions changed and allowed the development of more abrupt junctions. In a way, you can think of this as allowing faster, more powerful highergain devices. Like the diference between a 1950s engine and a modern V8. What does all this mean for the silicon fuzz pedal? Well, first because the devices are more reliable, there is less variation in important parameters like Beta. Now, they are more similar and it is less likely that you get a wide range in values. In theory, this will eliminate some of the variability in the pedal and two should sound more similar. Heres the two big differences though. First, remember those parasitics of the germanium transistors? Those have been made much smaller in modern silicon transistors and the devices operate at much higher frequencies. What this means is that more of the treble will usually come through in a silicon fuzz pedal. Therefore, brighter sound. Second, in general silicon transistors have more gain, higher Beta, then Germanium transistors. What this means is that it will distort, or fuzz differently. Usually, these are manifested as higher order harmonics. This answers the question, why does a silicon fuzz sound harsher than a germanium fuzz? The reason is that the silicon transistor devices have more gain causing different distortion profiles that are sharper with mroe high frequency content. They also have less parasitics which make them sound brighter because the higher treble eq area isn't lost. Some people will swear against these pedals saying they are too harsh while others love them. Overall, you can make really great sounding silicon fuzz pedals with modern transistors if you take a lot of time to design them and take into account the high gains. 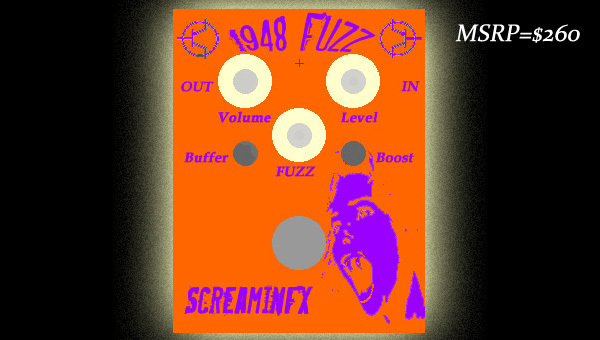 I make a silicon fuzz, call the 1954 Fuzz, that sounds much less harsh than many others because it has a circuit that performs in a softer way. So, whats the best fuzz pedal out there? This is really up to you. Here is a simple chart to help you decide which ones you should focus on. Less stable with temperature, heat such as the sun or strong stage lights can cause problems. Closer to 60s vintage sound or actually vintage if certain transistors are used. Harder to make sound good because requires transistor matching. Easier to build if they aren't matched because transistors have tighter tolerances. So whats the best fuzz for me? I personally make one of each! For vintage tones I use the 1948 and for tighter, more stoner metal I use the 1954 fuzz. If I want a deep bassy fuzz, I usually use the 1948 or peppermint. However, I also own all the ones in that video and its always hard to choose!